Years before our treehouse was even a twinkle in anybody’s eye, there was another project I raced to complete in time for one of my daughter’s birthdays: the Volkswagen bus bed. In this case I wanted to get it done in time for her 3rd birthday, as the crib’s days were numbered -- she was climbing in and out like crazy. I’d looked into lots of different kinds of toddler beds, and there were plenty of cool ones — but the cool ones were expensive. I’d seen on Instructable (and passed over) another VW bus bed a guy had built from the ground up, but it looked like it was beyond my skills, so I continued to ponder. 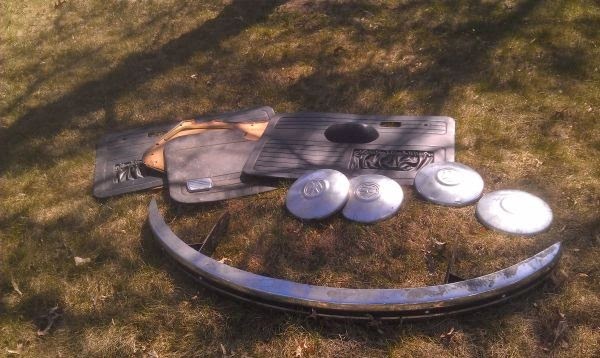 One day I was looking at the Craigslist “free” section, and there was a guy down the block — a teenager, actually — who was giving away a VW Beetle bumper, hubcaps, and some interior door pieces. He’d recently rebuilt a bug, and had extra parts, and wanted to help someone else out who was perhaps restoring one themselves. With no expectations, and really no plan, I emailed and said I’d like the pieces as I was considering building a VW bed for my kiddo. That afternoon I heard back, he thought it was the most intriguing email he’d received, and he wanted me to have the stuff. Free: Super Beetle, ran when parked, parts missing. So, as they say, it began there. I knew I wasn’t much of a carpenter, much less a proper woodworker; I needed to simplify my plans considerably to take into account the mostly self-taught level of my own skills. It struck me that I could build a VW bus around any old bunk bed, basically hanging panels off that weren’t necessarily structural. So I started with Craigslist again, and picked up a used metal twin bunk bed for $30. Then it was time to start imagining how it would look. Vroom vroom. Can you see the VW bus? Not really? Patience. I decided I’d basically build a sort of half-moon box in the front to fit the bumper, and mount a steering wheel on that. Then I’d hang a couple of bus-shaped side panels from the bunk bed somehow, and that would be that. So I ran to the store and picked up a few sheets of nice plywood and figured I’d be done in a few days. Note to DIY folks: a 2004 Honda Odyssey can fit full sheets of plywood if you take out the seats. To say the project grew to get out of hand would be an understatement, and is probably wholly unsurprising to my readers. Things with the VW bus bed were about to get ... more complicated. Cooler, too. Your creative concept is just awesome. Just amazing gift for your 3 year old. She must be proud of her dad. Cheers. So what grade / thickness plywood did you use? And what would you step down to, if doing it over? IIRC it was 3/4 inch sanded; you know how big box stores are, everything looks warped, but these didn't (and the price reflected it). In hindsight half inch would have been plenty thick enough, would have been less expensive, and would have made the whole thing lighter. Also since I wound up obsessively sanding, priming, and painting, I didn't need such a nice looking piece of wood. You are an awesome Daddy who is doing everything he can to help his daughter become an awesome young woman. Too bad the world isn't made up of all Daddy's like you. Congratulations on your success and God bless you. What a cool idea. I love it! I wish you were my daddy! LOL. Keep up the good work! I know your daughter will appreciate this when she gets older. You rock, DIYDad. What a wonderful thing to do for your daughter. I love it. Just want to know how in the world did you get it from garage to bedroom? ?